With the slow wrecking of Queen Anne’s Revenge, you wouldn’t expect much of value to be left on board and you would be absolutely right! We have found to date only 16 objects identified as silver – at least 3 coins, 2 shoe buckles, and 2 spoon handles as well as many unidentified fragments. Even though silver is a noble metal, meaning that it is relatively resistant to corrosion, we find the silver on the wreck in varying conditions from no longer existent in its metallic form (only a corrosion product remains) to a fairly stable metal. Buckle QAR1340.000 has a substantial layer of corrosion, while buckle QAR2275.000 looks very solid. Generally, silver corrosion pattern is visibly unique and is a helpful tool in identifying silver while the metal is still obscured. In addition, analysis using X-ray fluorescence can be a valuable tool in identifying the elemental makeup of an object, including those made of silver. As with many objects from QAR, the conservation of silver begins with removing the concretion around it. Buckle QAR2275.000 was found encased in a more substantial iron concretion. By contrast, buckle QAR1340.000 was found loose on site and exhibits the typical corrosion pattern you would expect to see on a silver object. In this case the concreted material was partially removed using hydrochloric acid and a scalpel. Due to the fragility or lack of the metal, not all the concretion was removed. Once the concretion is satisfactorily removed, the lab generally uses chemicals to complete the cleaning process. If there is copper present, it is treated with alkaline Rochelle salt solution to gently remove copper corrosion products. The next stage is to reduce the silver corrosion to metallic silver using an alkaline dithionite solution. When chemical cleaning is complete, a coating of acryloid B-72 is applied to protect and consolidate any fragile surfaces. Unlike your great-grandmother’s silver, silver from QAR does not have a shiny surface. It does, however, echo the great mystique of the Golden Age of Pirates. -Ganiaris, H. “Reduction with Gain: The Treatment of Excavated Silver Coins with Alkaline Dithionite.” In D. Goodburn-Brown and J. Jones, eds., Look After the Pennies. London: Archetype Publications. 1998. -Plenderleith, H.J. and A.E. Werner. The Conservation of Antiquities and Works of Art. London: Oxford University Press. 1971. 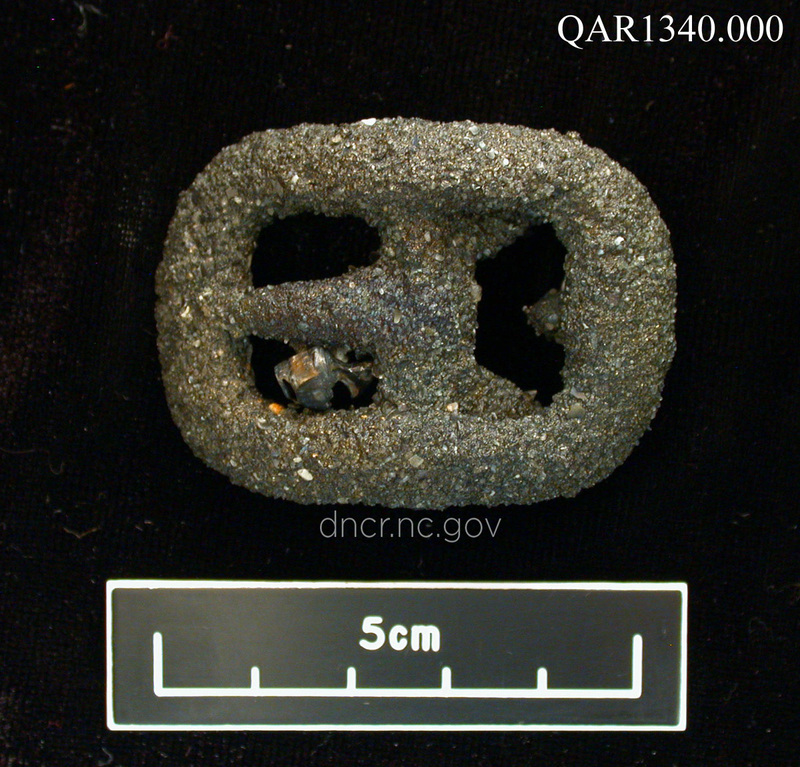 -Silver shoe buckle from the QAR site. Image by NC Department of Natural and Cultural Resources. 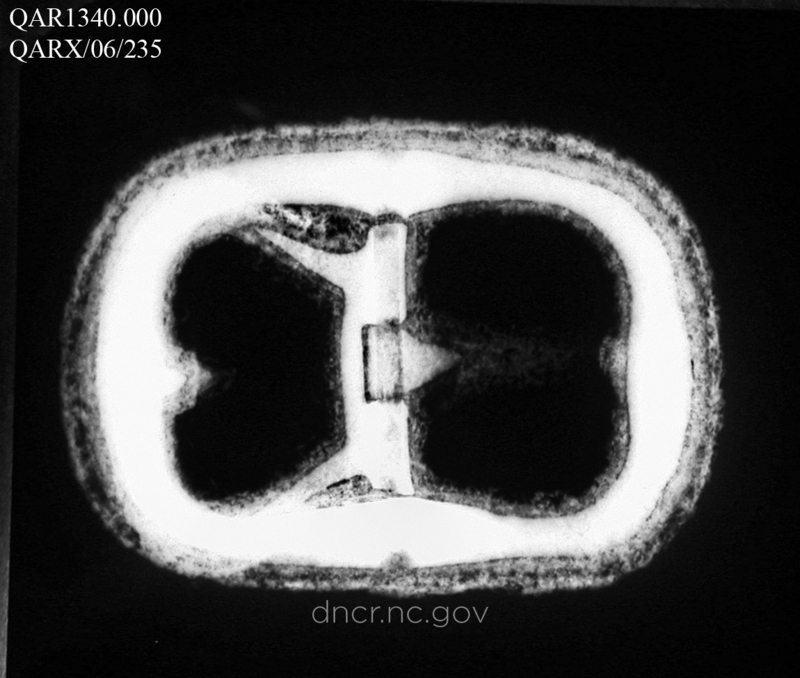 -X-ray of silver shoe buckle from the QAR site. Image by NC Department of Natural and Cultural Resources. 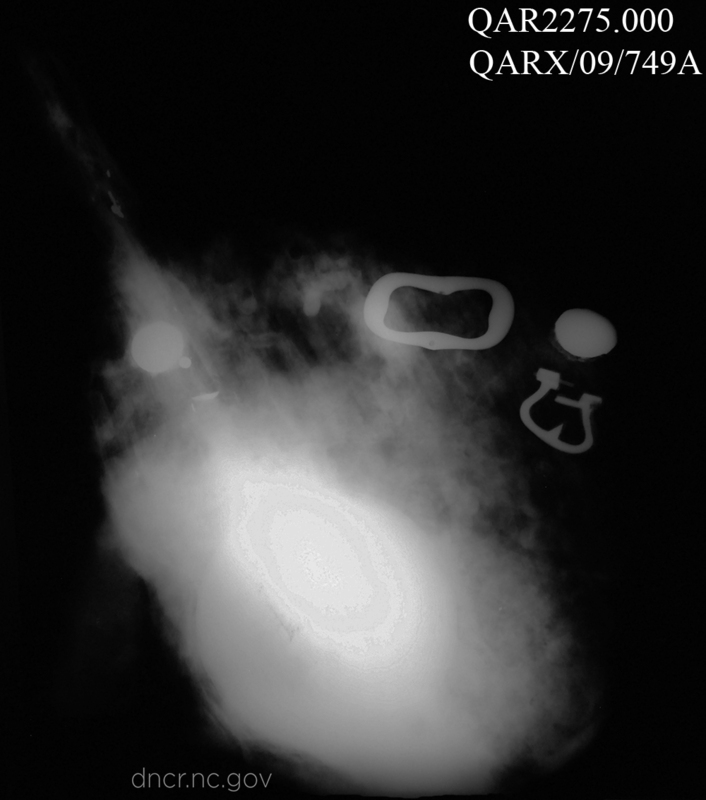 -Silver buckle components visible in x-ray of larger iron concretion from the QAR site. Image by NC Department of Natural and Cultural Resources.